The Polaroid Corporation was founded by Edwin H. Land. He registered his first patent (for a synthetic polarzier) in 1926, and created the Land-Wheelwright Laboratories in Boston with George Wheelwright III in 1932. The company initially produced glasses with polarized lenses, including 3D glasses and Army issue goggles. The inspiration for instant photographs reportedly came to Land from his daughter, who while on vacation in 1943, asked her father why she couldn't see a photo he had just taken right away. By 1947, the first demonstration model of the instant camera was complete. The first Land instant cameras (Model 95) were sold in 1948, and by 1956 the one millionth Polaroid Camera was manufactured in Cambridge Massachusetts. Colour instant film was introduced by the company in 1963, and soon after automatic film pack cameras were developed. Over the years, the company had many spokespeople for its products, including Lawrence Olivier, Steve Allen, the Muppets, James Garner, Mariette Hartley, Sinbad and the Spice Girls. 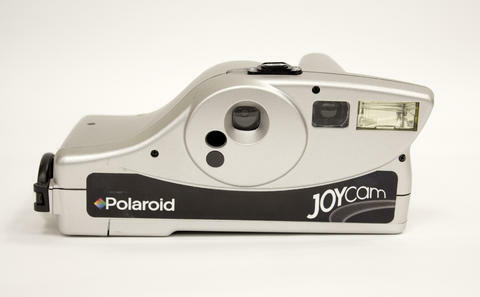 The original Polaroid company filed for bankruptcy in 2001, and by 2002 it was a new private company held by Bank One. Item is a point and shoot camera for 7.3 x 5.4 cm instant photographis with Polaroid 500 Film, originally designed for the failed Captiva camera model (early 1990's). The camera was made very inexpensively, and camera back is held in place by only a sticker that acts as a hinge. Item is from the Wilhelm E. Nassau/Wilfrid Laurier University donation, accession number 2011.018. Moved to the Heritage Camera Collection in 2013.